Above you can see a photo of a bird that I found during my hike through the Schellbruch Area in Lübeck. I saw five of them and some other hikers asked me if I would know what kind of bird it would be, when they saw me with my camera. And to be honest, I had absolutely no idea, and even at home the bird gave me headache because it was super hard to research the bird name, but I do now know what kind of bird it is. The problem however was that this is not a native bird in Germany, and it was no wonder that I couldn’t find any information’s on German websites about birds. My first suspicion during research was that it could be a stork, because we have some here and some of them look a bit similar. But then I thought that I must be wrong, because the super round beak of the bird I found was so different to the beak of a stork. At some point I have up to research on German websites about native birds. 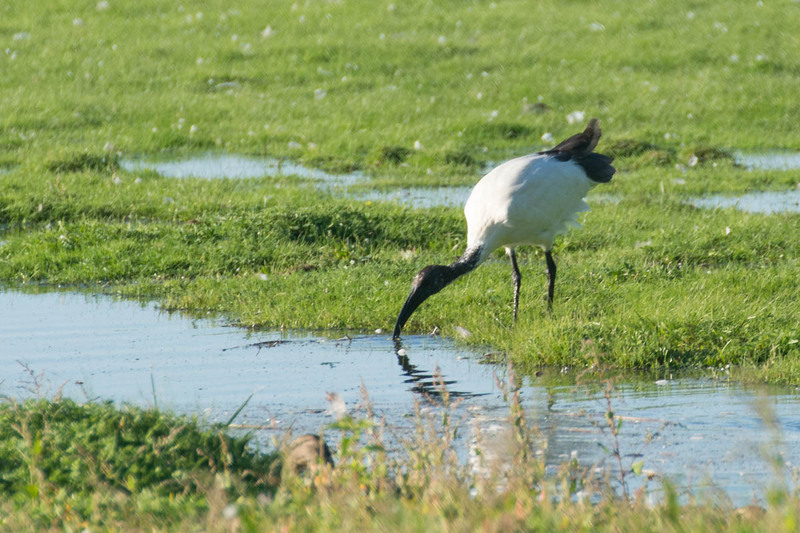 Looking for bird species outside of Germany was the right thing to do, and that’s how I found out that it must be the African sacred ibis that you can read about on Wikipedia. It took me hours to find that out, but researching is fun too, and you learn something during the research, that is cool! Remains the question why I found the bird here in Northern Germany. The area where I found the bird is a migrating bird site, it’s possible to find birds there that are less common in Germany, but that doesn’t count for all birds. As far as my research goes, the African sacred ibis is definitely not one of the migrating birds where I live. According to the German Wiki page about the bird, ibises found in Germany are usually escapees from captivity. Apart from that, since 1970 there is a growing population from bird parks in France, and they have been found in Italy too. The bird is listed as invasive species, in the European Union. From the photographers standpoint, I am just happy that I could take photos of a not so common bird in Germany. I did only upload one photo for this post, but I have a full series and will upload the best ones individually or together in the future when I have edited them all. I looked it up because I was wondering why it was so far north. Wikipedia just said “It was also introduced successfully to the British Isles.” I guess it expanded out from there. Yes, I have read both, the German and English Wiki article and this is a possibility too, although not mentioned in the German article where it’s about the French population from 1970, and the ibises from captivity in Germany. I can’t see a bird ringing on this photo, so, it might not be one from captivity but from an actual population from Britain of France. I have some more photos of the series that I didn’t take a look at yet, maybe I find a ringing on one photo.